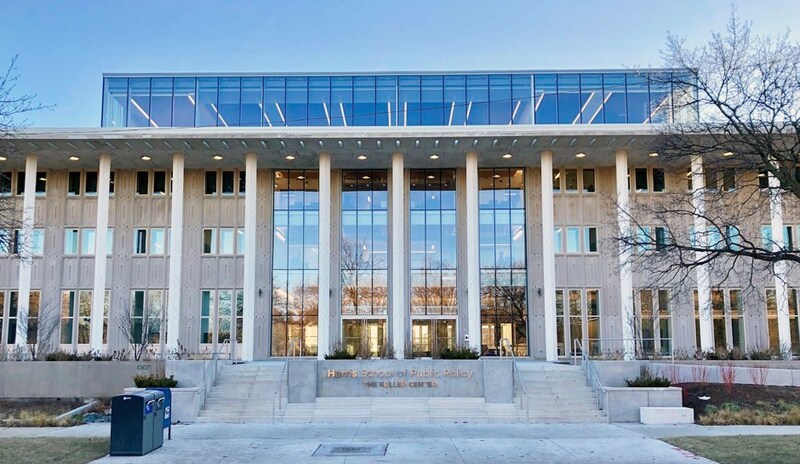 The newly-rehabilitated Keller Center, home to the University of Chicago’s Harris School of Public Policy on the largely African-American south side of Chicago, Illinois is a repurposed and renewed 1963 building that has been redesigned to reconnect it to the local neighborhood, and the local culture. It was designed by the architect of New York City’s Radio City Music Hall and Washington, DC’s Kennedy Center: famed architect Edward Durell Stone. Today, the Keller Center is setting the standard for sustainable design on the UChicago campus, and among policy schools around the world. 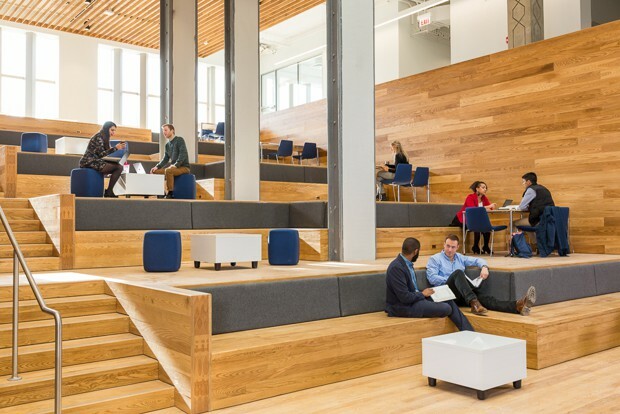 The building achieved LEED Platinum and Living Building Challenge™ (LBC) Petal certification, making the Keller Center one of the most sustainable buildings in higher education and the city of Chicago. Inside, it’s always been a rather cold, alinating space. But no more. The renovated building’s four-story atrium is now dominated by terraced stair seating created in the shop of renowned Chicago artist Theaster Gates, whose commitment to revitalizing African-American neighborhoods around Chicago is both long-term and ongoing. 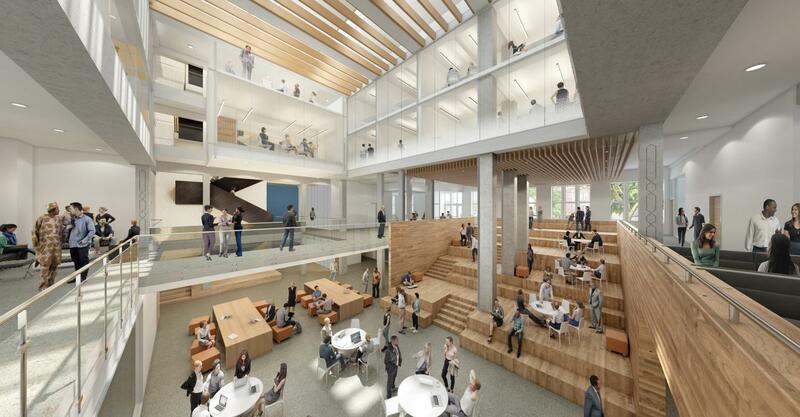 The Keller Center reopened in January, and the redesign hopes to heal some of the University of Chicago’s notorious town-gown divide, which derives both from its architecture and its planning. Architecturally, this adaptive reuse of Stone’s building—it was originally a conference center, then student housing—makes it more open to the surrounding neighborhood. Much of its limestone façade was replaced with glass, making it visually more accessible. “They [originally] designed this building like a wall,” says Gabe Wilcox, of Farr Associates, the architects who designed the renovation. Restoring and reimagining Stone’s four-story, 20th-century masterpiece the Keller Center incorporates several world-class sustainable design practices. The focal point of the Keller Center is the Harris Family Foundation King Harris Forum, a sun-soaked, four-level atrium that reaches the full height of the building. Clad in beautiful, locally-sourced ash wood, the Forum represents a key policy story of Harris Public Policy at the Keller Center. The ash trees in the Forum come from trees in Chicago’s south and west side parks. The trees, infested by the emerald ash borer beetle—that has wiped-out ash trees—which provide one of the world’s best woods–all across the continent. The dead and dying trees were a hazard and had to be felled. 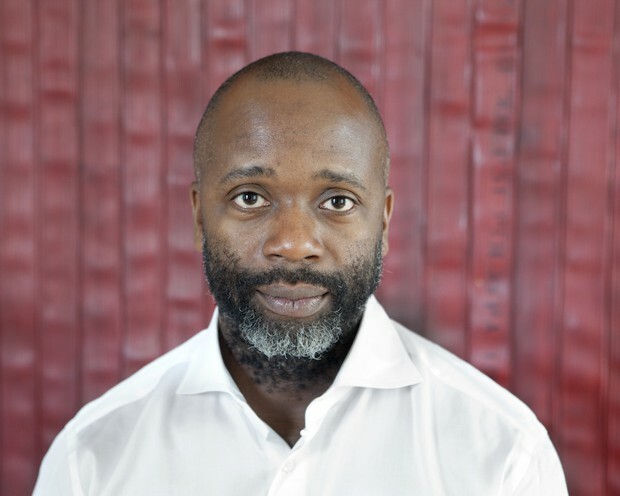 Artist and leader in ethical redevelopment Theaster Gates is Senior Adviser for Cultural Innovation and Adviser to the Dean at Harris. He reclaimed the wood for use in art and building fabrication projects. Through his Dorchester Industries Mill on the South Side of Chicago, local residents milled the wood, which appears both in the Forum, and throughout the Keller Center. The Keller Center uses other reclaimed materials throughout the building, including toilet stall doors and light fixtures from the original structure. 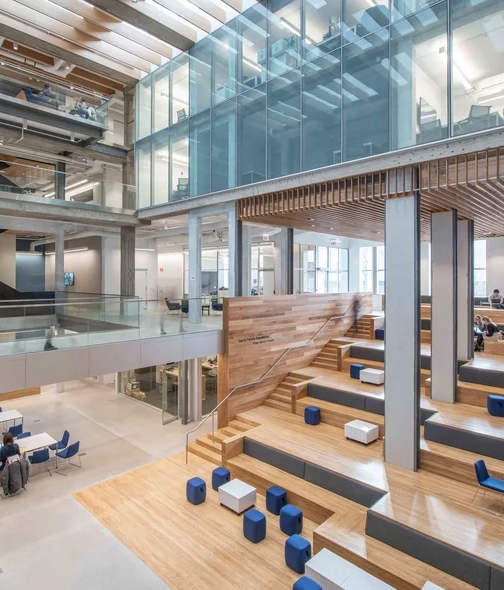 The Keller Center’s design incorporates rainwater capture, which reuses available resources to work key infrastructure in the building, and also mitigates impact on Chicago’s stormwater systems. The rainwater cistern captures rainwater and uses it to flush the building’s toilets, diverting rainwater from Chicago’s overburdened sewer system. It also provides more usable space for the rooftop solar panels. The rainwater cistern tank holds 15,000 gallons of water and diverts 525,208 gallons annually from the Chicago’s sewer system. That’s enough water to completely fill the four-story volume of the Keller Center’s atrium. The Keller Center’s solar energy system produces up to 150 kWh of carbon-free electricity each year. This is enough energy to power 11% of the building’s annual energy use, or about 15 average homes annually. The Keller Center’s monumental stair connects all levels of the building. This strategy is essential to Active Design Guidelines, which create opportunities for daily physical activity. In addition, the Keller Center incorporates Universal Design principles throughout, which work to enable and empower diverse populations by creating access for people with diverse abilities. All new windows on the perimeter of the Keller Center incorporate a special UV reflective coating that makes the building more bird-friendly. The coating incorporates a spiderweb design that birds innately avoid, reducing collisions with the windows. This is an example of biomimicry—the emulation of nature’s patterns and systems—in green building design. To support user comfort in the Keller Center, lighting in the building emulates the full spectrum of light that the sun emits throughout the day. Artificial lighting that mimics the sun’s color temperature helps regulate our circadian rhythm (our internal clock), which controls many of our physical, mental, and behavioral states. This revitalized building shows that the 3Re Strategy (repurpose, renew, reconnect) doesn’t just apply to neighborhoods and cities: individual buildings can also use it as a path to revitalization. Unless otherwise credited, all images are courtesy of the University of Chicago Harris School of Public Policy. See full article by Zach Mortise in CityLab, from which some of this was excerpted and adapted.